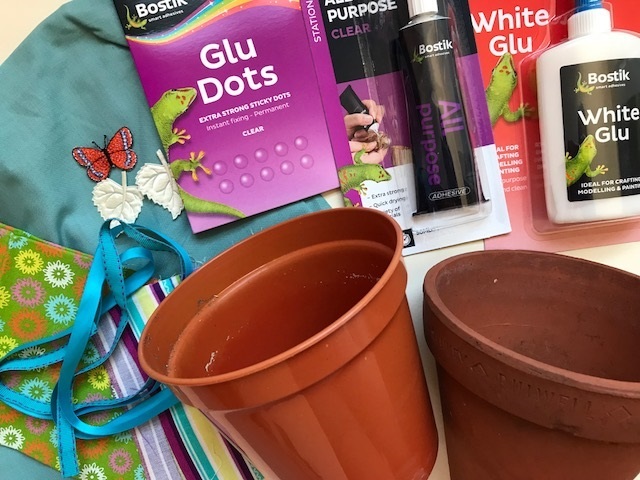 I am currently working with Bostik to create a series of crafting posts with projects that you can complete using Bostik products. Each month I'll share a themed craft, and this month my theme is garden decor and accents. Here's how I made these colourful decorated plant pots, using fabric and other embellishments. Although they will last much longer if you use them indoors, if they are placed in a shady, sheltered spot they should still stand up to the weather for some time! Cut a piece of fabric. The length should be the circumference of the pot and the width should be 5-10cm longer than the height of the pot. Wrap it around the pot to make sure that it will cover the pot completely, and trim as much excess fabric as you can. 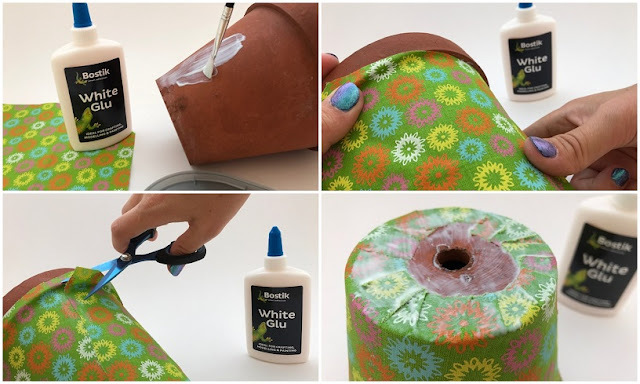 Coat the pot with Bostik White Glu using a paintbrush to make sure that the glue covers evenly. Stretch the fabric around the pot and press down, making sure to smooth out any wrinkles as you go. When the fabric is all in place you can trim away any extra. 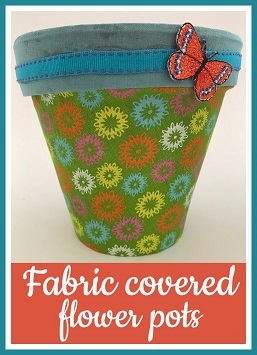 To cover the bottom of the pot, cut the overhanging fabric into small strips and pull them into shape over the bottom. Hold them firmly in place with a thick coat of White Glu, and leave to dry. 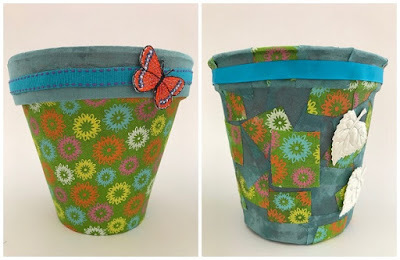 To decorate the rim of the pot I used a strip of contrasting fabric. The fabric was already hemmed, which made a nice smooth line. 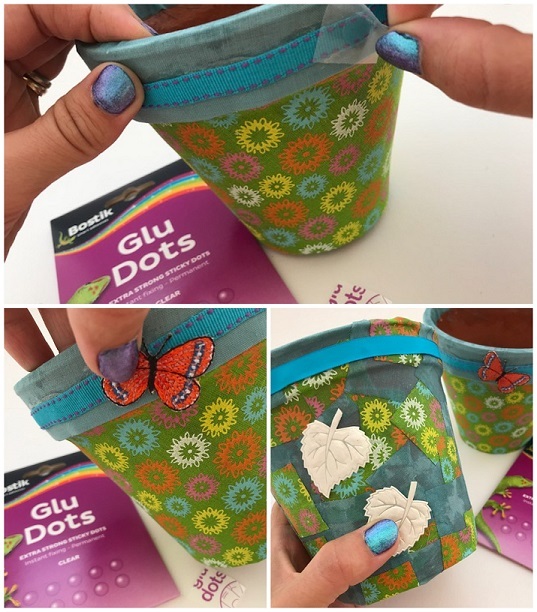 Use the White Glu to stick the fabric to the pot. Fold over the excess fabric around the rim and glue down firmly. When it has dried, use Bostik All Purpose to add a strip of ribbon. The All Purpose glue can stick all sorts of different surfaces together and is a really strong adhesive. Cut your fabric into small squares - it's a great way to use up any fabric scraps that you have lying around! 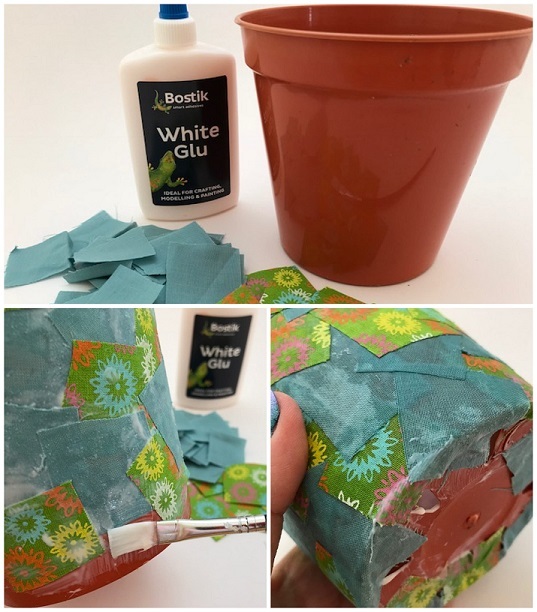 Then once again use the Bostik White Glu to stick the fabric to the plant pot. I used a brush with stiff bristles which was really good for making sure that the fabric stuck smoothly around any ridges. 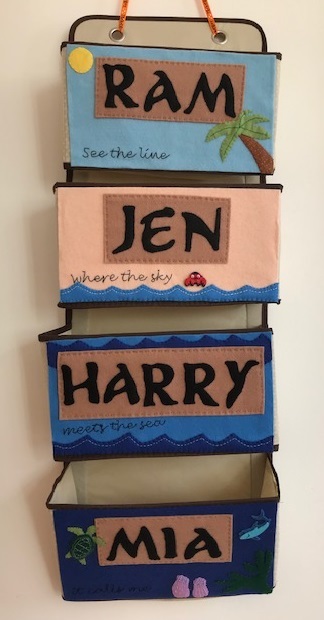 I made sure to use plenty of the White Glu on top of the fabric to hold all the edges down smoothly - it dries with a really nice finish and it's strong enough to make sure that the fabric holds firmly in place. To add some extra embellishments I used Bostik Glu Dots. The ones that I used are the Extra Strong Sticky Dots. The thing that I love about glue dots is that they stick things together instantly, and they are also clear so you don't need to worry about anything showing through on your project. 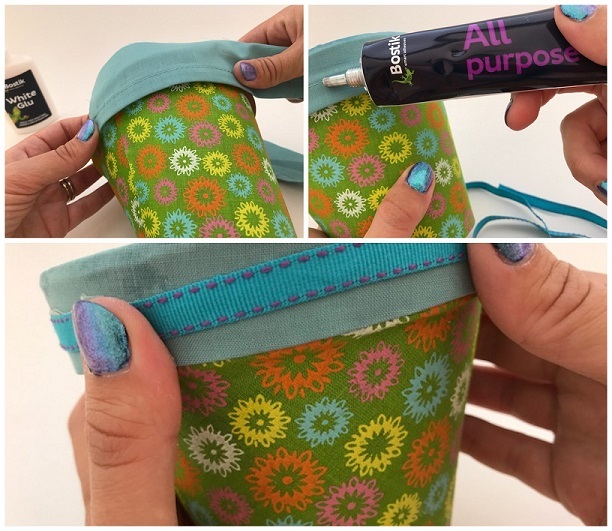 You just remove one side of the plastic covering, press the dot into place, remove the second plastic side, and add your embellishment, making sure to press down firmly. Here are my finished pots! 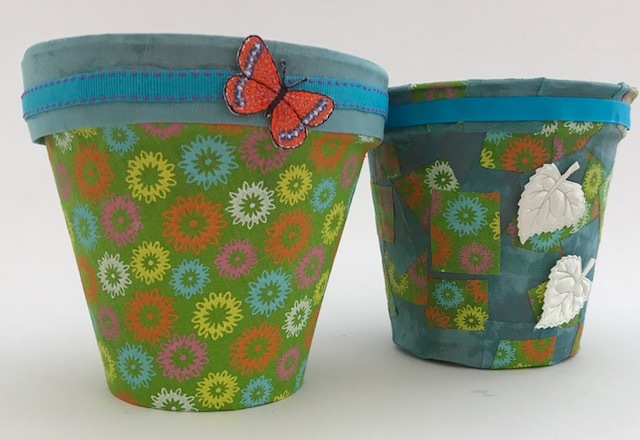 If you want to put a plant inside them you'll need to put it inside another flower pot so that it doesn't leak and spoil the fabric, and take care when watering. 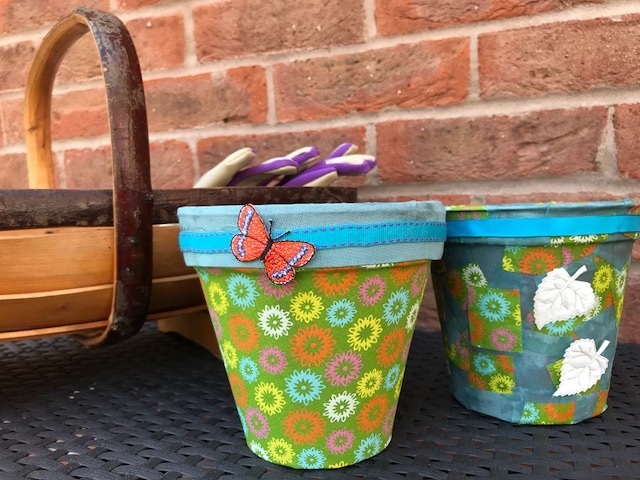 Of course they don't just need to be used for plants - they'd make great storage for pens, paintbrushes, make up brushes...anything that is calling out for some cheerful storage!